St. George’s University welcomed nine students from five countries during the summer as part of the International Federation of Medical Students Association (IFMSA) Exchange Program. Facilitated by the University’s Department of Public Health and Preventive Medicine, the public health projects were part of IFMSA’s worldwide campaign that allows approximately 10,000 medical students to participate in bilateral and equitable student exchanges in pursuit of global clinical and research experiences each year. Among those who participated was first-year medical student Janna Gribi from Medical University of Vienna. She spent more than four weeks working on St. George’s University’s Sports for Health Program and an occupational health program with the Grenada Cooperative Nutmeg Association (GCNA). At Grenada’s General Hospital, Asier Bombin, a first-year medical student from Complutense University of Madrid, Spain, with a keen interest in surgery, shadowed an attending physician, visited the operations theater, and sat in on patient consultations. “The health system in Grenada is really different from back home, but you don’t learn about those differences and get a greater appreciation for them unless you experience it yourself,” he stated. This entry was posted in Educational News and tagged best caribbean medical schools, caribbean medical schools, list of caribbean medical schools, top caribbean medical schools. The Vice-President of Texila American University launched the E- Conferencing Website on 9th September, 2014. 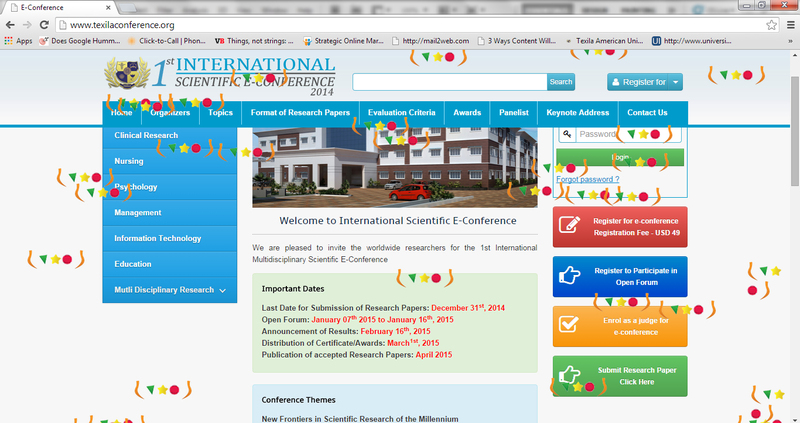 Texila American University Guyana, South America, is organizing its 1st International Scientific E- conference from 7th January to 16th January 2015. 1.Provide a platform for all scientists/students to disseminate their emerging research to investigators globally. 2.Provide a platform for a global dialogue on emerging research in multiple disciplines. E-Conferencing is the utilization of internet technology to carry out a “conference.” While they aren’t traditional conferences, e-Conferences allow participants to do most, if not all, of the things they would be able to do in a physical conference without having everybody in the same place at the same time. Participants have the chances to win Gold, Silver and Bronze award for best research papers and also an award in the name of an eminent personality for the outstanding research paper. All accepted papers will be published in South American Journals. Call for Research Papers on Public Health, Clinical Research, Nursing, Psychology, Management, Information Technology, Education, Alternative Medicine, Theology, Food and Nutrition and Political Sciences. For years, less competitive medical school applicants have been attracted to the more liberal admissions policies of medical schools in the Caribbean. Other applicants have been attracted to medical schools overseas for personal reasons, including simply wanting to explore a new culture. However, with a myriad of languages, laws, and curricula, it’s hard to know what you’re getting—especially if you plan on returning to the U.S. for residency. Caribbean Medical Schools are the one among the best international medical schools in the US. It assists you to become the best doctor you can be. While considering the foreign students, it would be easy to attain sponsorships and proper funds for pursuing the studies overseas. It is mandatory to weigh the good and adverse affects of pursuing medical studies in a Caribbean Medical School before taking a firm decision on this. Generally it is less expensive to attend a Caribbean Medical School. An important fact is that there will be extra costs associated with the study abroad programs, such as travel expenses and travel student health insurance and a lot more. However, even with those added expenses the total cost of education is far cheaper in a Caribbean Medical School when compared to other institutions. Some Caribbean medical schools have rolling admissions. It implies that the chances to apply to a particular medical school is very wide provides a maximum of three intake s year. Some schools allow only two fall intakes in a year. This can make the application process far or less stressful to a large extent and permit more time to ensure everything required in order before submitting the application. The top list of Caribbean Medical Schools has the USMLE first-time pass rates that are at or above the. average. High USMLE pass rates indicate that the programs offered by Caribbean schools are top level and that the education and advancement is taken in the right way. The first two years for the Medical students will be pursued in the overseas campuses for all Caribbean medical schools, but the clinical rotations or hands on trainings for the top schools are in the United States. This offers added advantage to the students in a way that it can benefit from the higher acceptance rates to get into the Caribbean universities. Deciding which medical schools to attend is an ever changing decision for a medical student. It’s important that enough time is utilized to opt for the best Caribbean school that well suits the requirements of the students. The Caribbean Medical Schools have afforded many unsuccessful applicants to the US Medical Schools the opportunity to pursue medical education and then return to US for the Internship processes. However, the challenges of studying in a foreign environment, being immersed in a different language and culture, trying to secure residencies in the U.S., passing the boards, etc., should be carefully examined. The place where you pause to study should be hectic-free. Caribbean holds the ranking for the world-class islands for its beauty and exotic wildlife. The islands impersonate the paradise on earth with beautiful white sand along with the lush green plant life encompassed by beaches. Moreover, the oceans in the Caribbean hold its beauty with the lustering of the sun. Obviously, the Caribbean Medical Schools act as a good source of relief for the students with less MCAT scores. Acknowledged as a medical organization, it cites a handful of uniqueness by adopting undergraduate and postgraduate medical courses, health-related research and several other master degrees. Also, it has tie-up with several hospitals in the US that allow students to perform their clinical practice. Chasing your dream to become a medical professional either at home or abroad should not be terminated with high tuition cost or low acceptance costs. Medicine as a career is very satisfying and rewarding. It is important for the student, who plans to take up medicine as a career, to have an aptitude and passion for the career options his vocation offers. Once decided on, the student has to go about seeking admission in a proper medical school. The medical schools in the Caribbean are the feasible choices while considering the educational institutions regarding the medical profession. These schools are properly accredited by the relevant International Board and acts as one of the good destinations for a good career in the field of medicine. The place you chose to study should be peaceful. It holds right for the Caribbean Medical Schools. The main highlight of the placid nature is the location of the institution and surroundings which is really beautiful. Besides the exciting location of the Caribbean Medical Universities, it has even more advantages. The cost of education is cheap and affordable in the Caribbean Medical Schools when compared to other institutions in the US. This makes the Medical Schools in the Caribbean a very good option for the people who seek medical education abroad. Acknowledged as a medicalorganization, it cites a handful of uniqueness by adopting undergraduate and postgraduate medical courses, health-related research and several other master degrees. Also, it has tie-up with several hospitals in the US that allow students to perform their clinical practice. This internet driven technology saves the people to drive into each university that the students are interested in. This medical education portal is useful for the students who are willing to study medical education in the Caribbean region. Caribbean medical schools are viable choices for educational institutions that can be considered when one has decided to build a career in the medical profession. These schools have received accreditation from the international board and are great starting points for those that seek to become doctors one day. There are different online portals or the education portals that provide list of universities that are located in the Caribbean region. The Caribbean medical schools listed here are recognized by the world health organization. As it takes more time and effort to collect brochures, contact details of a university, the portal has featured some of the top universities in the listings. This promotes the students to choose a best medical school in the Caribbean with a short span of time. The details provided in this portal are updated at regular intervals or periods of time. It ensures that the students would receive the up to date information regarding the Medical Schools in the Caribbean for different courses and programs. To get enlisted in the portal, the Universities or the Medical Schools should get registered and further the modifications can be done accordingly.